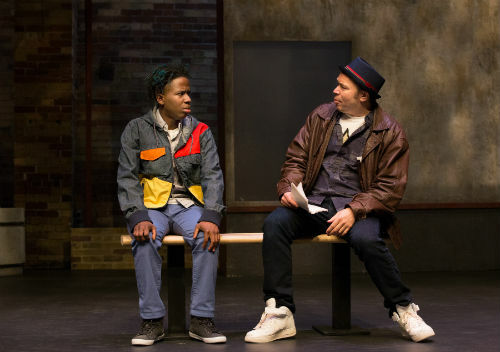 My young guest and I headed out to see Risky Phil–a new play by Paula Wing, currently on stage at Young People’s Theatre–in the middle of an April ice storm. We thought it was a little crazy to be venturing outside, but the TTC gods smiled on us , and we arrived safely. In the end, we were glad we made the effort: Risky Phil is a charming play about fathers and sons, friendship, and figuring out how to be a family when your trust has been broken. Phil (Daniel Ellis) is a young boy in Toronto who is being raised by his Aunt Gigi (Ordena Stephens-Thompson). Phil’s parents have been dead since before he can remember, and Aunt Gigi runs a hair salon out of their apartment. Their relationship is governed by a contract detailing how many hours Phil needs to help sweep the salon before he can go play hockey with his friend Jamie (Tal Shulman). It initially seemed a little rigid to me, but it’s actually very warm, loving, and almost playful. One day a new client shows up, and Phil discovers he isn’t an orphan. As the threads of his family story start to unravel, Phil has to renegotiate all of his relationships and figure out who he really is and what he really wants. There is a secondary plotline about Jamie and his dad, David (Brian Bisson), as they also figure out how to relate to each after David’s divorce from Jamie’s mom. The action moves from Aunt Gigi’s apartment to the park where Phil and Jamie do hockey drills with David to the street corner nearby. For each scene change, the actors slide the colourfully-painted set pieces around the stage while rhythmically bouncing to some very catchy instrumental music. Everyone around us was bouncing to the music too. My guest said that she really liked this play, and thought all the actors were very good. I agree. Daniel Ellis as Phil was charming and wise beyond his years. Living with Aunt Gigi has turned him into a master negotiator, but it’s done with a wink and smile. I am always impressed with how convincingly adult actors portray kids and teens in YPT performances. Ordena Stephens-Thompson, as Aunt Gigi, was also a standout for me. She clearly does not take crap from anyone, but her affection for Phil feels genuine. She is trying to do what’s right and only wants what’s best for him. My favourite character, however, was Junior, played by Jamie Robinson. He is full of jittery energy as he tries to navigate his newfound sobriety. He parrots back the self-help lingo he’s been learning, but he really does want to make amends. Another feature we liked was the chance to ask the actors questions after the show. I find it interesting to see what intrigues kids about performance. They asked about how the sets moved, how long it took to rehearse, and why each performer become an actor. The actors handled both personal and technical questions with aplomb. The themes in Risky Phil are difficult and include parental neglect, mental illness, and drug addiction. But I though they were handled sensitively and appropriately for a young audience. My guest thought the play would be fine for someone as young as 7, and might still be interesting for young teens. Though we may have taken a risk braving the weather on a snowy Sunday, it was worth it. We’d both recommend Risky Phil to our friends. Risky Phil is playing until April 27, 2018 at Young People’s Theatre (165 Front Street East). Shows run Monday – Sunday at various times. See the website for the full performance schedule. Relaxed Performances are available. See here for details. Tickets range from $10-$34 +HST and can be purchased online or by calling the box office at 416-862-2222, ext. 2.